If there is one fashion trend I can convince you to try in 2018, it would be wearing a dress over jeans. 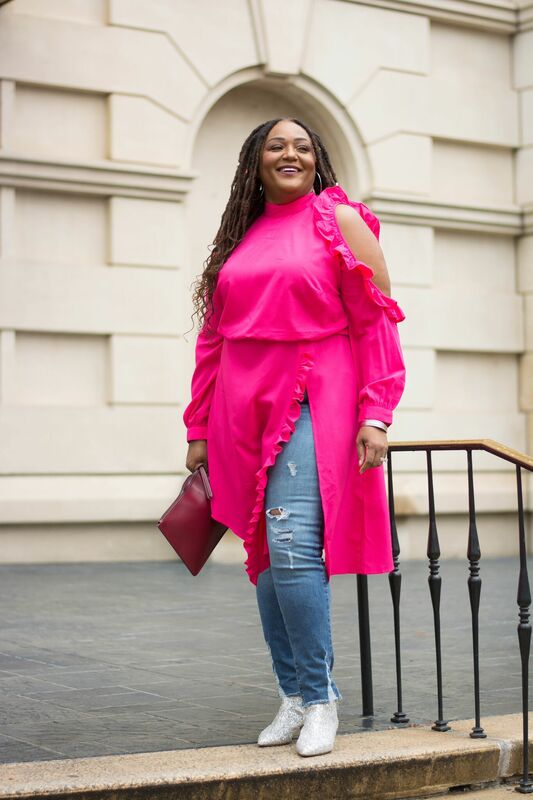 Women everywhere are swapping out their wildly popular statement tops for full-blown dresses and layering them over jeans. 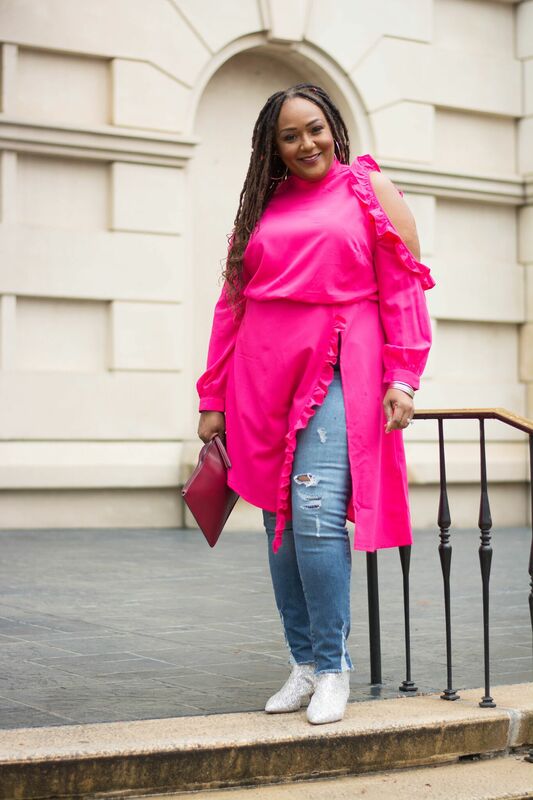 Tops with deconstructed silhouettes and ruffled details will take a bit of a backseat to the dress over jeans trend this spring. And the popularity of the trend is sure to go into overdrive, and I am here to help the #Freehive master it. Scores of women in magazines and on the streets are rocking this cool style. Dresses are worn in every color, shape, length and fabric. The patterns, prints and embellishments add a modern twist to an otherwise easy to wear frock. The trend ushered in a fresh new way to deal with temperamental temperatures through layering while making your wardrobe work double duty. 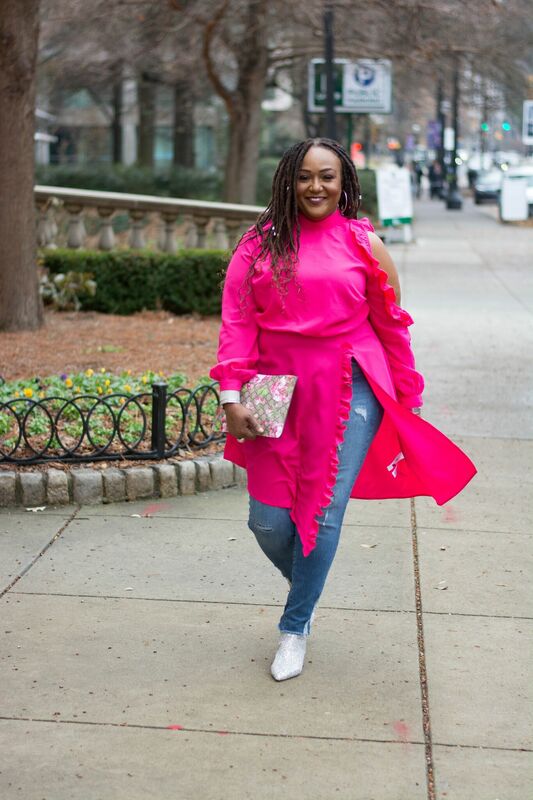 Although my pretty pink “dress” is actually a blouse from ASOS, it’s a perfect example of how the statement top naturally evolved into the dress over jeans trend. Layering a dress over jeans isn’t exactly a new trend as it goes in and out of style. But with every iteration, new, more stylish ways to master the trend emerge. 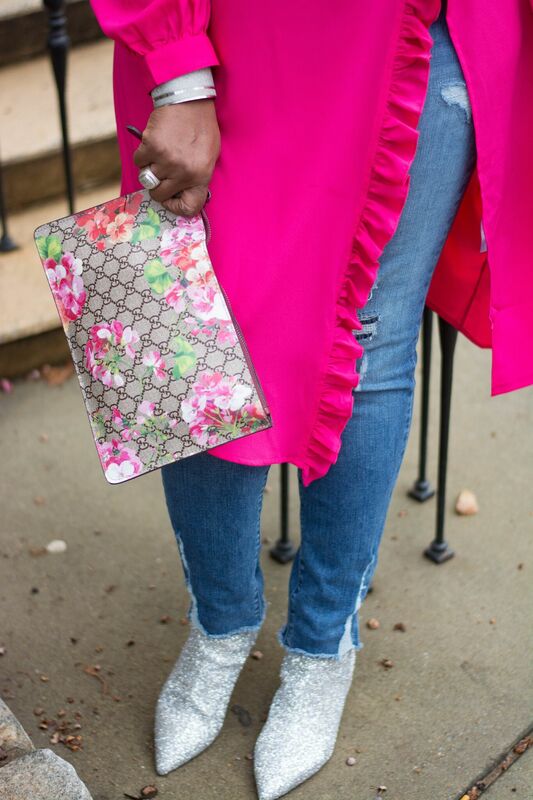 Also, layering a dress over jeans is such a great way to transition pieces from hot to colder months. The trend also gets your wardrobe to work double time. Think of how many ways to you style your otherwise straight-forward frocks! Ready to try it for yourself? Check out my five tips on how to pull it off. When wearing a dress with jeans, make sure the hemline is slightly cropped and skims the ankle. Wear with a statement dress, one with exaggerated sleeves, cut-outs and ruffles. Keep the rest of it simple. Layer a bustier dress over a T-shirt and wear with bootcut jeans. Toss on a sack dress with your favorite cuffed jeans, then tie a knot on one side of the dress at the knee. Wear your button down dress completely open over a cute tank and kick flare denim. When you try this trend (as you absolutely SHOULD! ), please share you looks with me. Thanks for stopping by! Really enjoyed this post and you did that Nikki. Had to check you out. You go girl. Thanks so much Nicole! 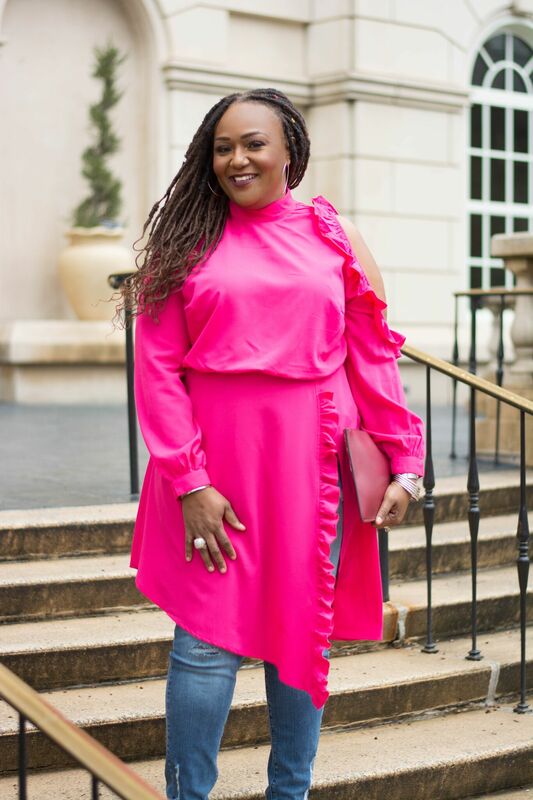 I am really digging the dress over jeans resurgence! I just love your confidence and the way you are carrying out this outfit. You know I had purchased a plus size long jean skirt but reluctant to wear it. But, now I will and thank you for the blog. I am also really enjoyed this post. I just love the way you carry this outfit. 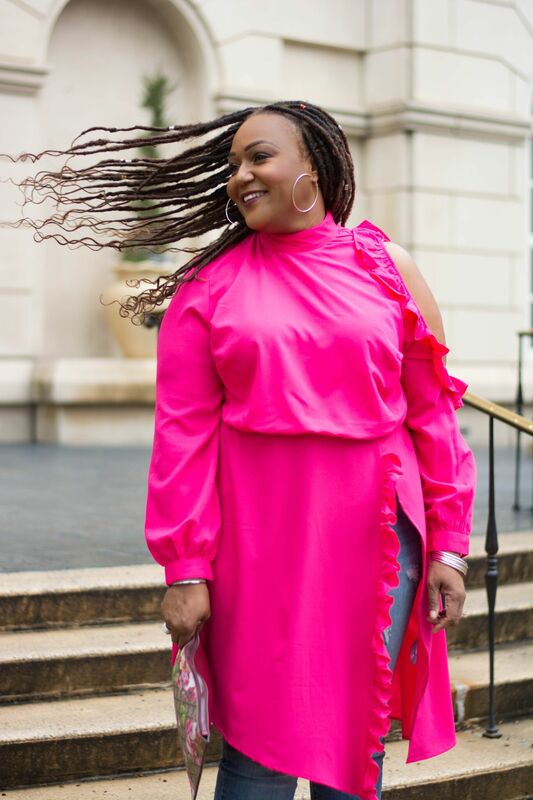 You know I also purchased a plus size jeans skirts online and its really comfortable or stylish to wear. Thanks for this post. Going to try this summer. Love it. Thanks for pointing out that the jeans must be cropped a little when you want to wear one that is partnered with a dress. I will keep this in mind because I have always wanted to try this style just to look different for once. I have always been wearing simple outfits, and it is making me bored. With this tip, I will be able to finally pull this off. Now, I just have to find the perfect dress for me.